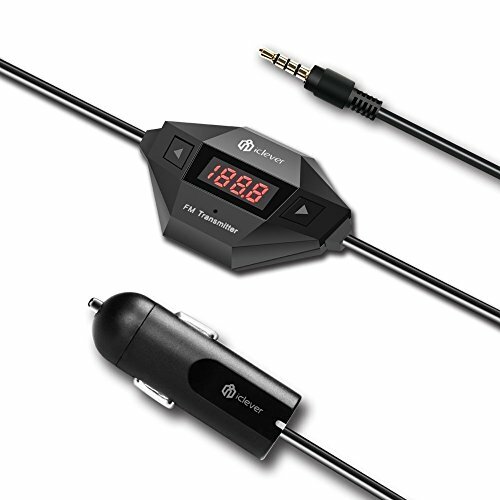 Amazon Best Seller for Bluetooth & FM Transmitter and Cell-phone Car Kits. Utilizing state of the art FM transmission technology, this unit allows you to make hands-free phone calls and listen to music over your car stereo system. It features easy installation and is universally compatible with any devices with a 3.5mm jack. Compatible devices include smartphones, tablets, PCs, MP3 and MP4 players. As an added bonus it comes with an extra USB port to charge your device simultaneously. 1) Does this work without an audio jack in your car? Yes, it does work. It does not need an audio jack in the car, but your car must have the capability of picking up FM radio signals. 2) How does the FM transmitter work? (1) Plug the FM transmitter into the cigarette lighter socket to power on the transmitter. (2) Plug the audio jack into an audio player (e.g. a smart phone, MP3 player). (3) Tune the radio station to a non-broadcasting frequency and then set the FM transmitter to the same frequency.